Bioelements Skin Editor unbelievably exquisite leave-on formulation characteristics dual-depth penetrating 3% glycolic and 7% lactic acid, plus the additional advantage of brightening fermented black tea extract (kombucha) and soothing free-radical fighter Canadian willowherb - all infused within moisturizing all-natural shea butter to make a formulation that appears exceptionally indulgent on the skin. Use it at nighttime to easily correct recent skin mistakes, and climate stress signs. 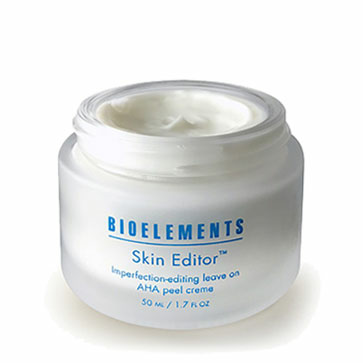 Bioelements Skin Editor is a powerful exfoliator that works to edit skin imperfections and long-term damage to instantaneously smooth rough and uneven texture, minimize dullness, brighten up dark damage, enhance clarity & color, concentrate on congestion, hydrate, minimizing the perception of lines - virtually all without unpleasant skin-stripping or surface-scraping. Apply to thoroughly clean, dry skin at night. Follow with a Bioelements moisturizer or Sleepwear® if needed. If your skin is acclimated to AHAs, it can be every night; skin new to AHAs should start at 3 times a week. Deep-penetrating 3% glycolic acid and mid-penetrating 7% lactic acid,Naturally buffing Canadian willowherb,Fermented, vitamin-rich kombucha (black tea extract),Certified organic shea butter,Water (Aqua, Eau), Lactic Acid, Cetearyl Alcohol, Glycerin, Glycolic Acid, Caprylic/Capric Triglyceride, Saccharomyces/Xylinum/Black Tea Ferment, Ceteareth-20, Sodium Hydroxide, Polysorbate 60, Dimethicone, Prunus Amygdalus Dulcis (Sweet Almond) Oil, Butyrospermum Parkii (Shea Butter), Epilobium Angustifolium (Canadian Willowherb) Flower/Leaf/Stem Extract, Salicylic Acid, Citrus Aurantium Bergamia (Bergamot) Fruit Oil Mentha Piperita (Peppermint) Extract, Cymbopogon Martini Oil, Anthemis Nobilis Flower Oil, Elettaria Cardamomum Seed Oil, Eugenia Caryophyllus (Clove) Leaf Oil, Guaiacum Officinale Wood Oil, Helianthus Annuus (Sunflower) Seed Oil, Ilex Paraguariensis Leaf Extract, Ribes Nigrum (Black Currant) Fruit, Polyacrylate-1 Crosspolymer, Pentylene Glycol, Potassium Sorbate, Hydroxyethylcellulose, Canarium Luzonicum Gum Nonvolatiles, Sodium Metabisulfite, Ethylhexylglycerin, Phenoxyethanol, Phenethyl Alcohol Natural.